It is heat resistant. You can put a soldering iron on Kapton tape and it will not melt. In fact, numerous flexible circuits are made with copper on a Kapton substrate where the components are soldered directly to the copper. It does not stretch. This may be either a pro or con, but it’s good when you just want to tape down wires. It is thin. Actually, it comes in various thicknesses. I usually get the 2 mil (0.002″) thick stuff in the 1/2″ wide rolls. When you’re trying to cram as much as possible into a given space, the low profile and smooth, slick surface help tremendously. The adhesive leaves no discernible residue. You can pull the tape off after a year and not worry about having to clean anything else up. As mentioned before, the tape comes in different widths and thicknesses, depending on your need. You can also get it with adhesive on one side or both, though there may be limited width/thickness availability for the two-sided tape. If you take apart any consumer electronics device nowadays, you’ll notice three or four different kinds of adhesives and tapes being used (I’d cover the rest because they’re also great, but I really don’t use them that much and don’t know what they’re called nor how to source them). Mostly, I use this tape as insulation on either a PC board or wires, especially if I think I’m going to have something on top of it that I’ll be soldering. It’s a bit overkill for just taping down wires, but still, that’s better than Scotch tape or electrical tape. 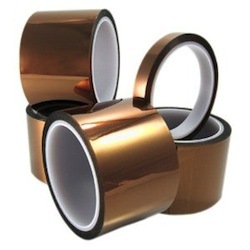 I have no favorite brands of Kapton tape, I just buy a roll from my local electronics supply house when I need more.